SOURCE: Mark A. Schusterman, M.D., P.A. HOUSTON, TX--(Marketwire - September 13, 2007) - Dr. Mark Schusterman, one of Houston's most respected and recognized plastic surgeons, is the Houston Medical Director for fig., the provider of Advanced LipoDissolve, and is leading fig. 's highly trained medical team in Houston. Advanced LipoDissolve™ is a non-invasive, no down-time procedure used to dissolve fat in common problem areas such as belly "pooch," thighs, love handles, and under the chin. To contour the body in specific desired areas, Advanced LipoDissolve™ permanently removes fat cells helping patients to achieve their body image goals. Administered by a series of micro-injections, the compound is delivered to areas of unwanted fat where it causes the fat cells to slightly swell and hardened before breaking down and being released from the body. People who regularly exercise and eat healthy but are having a hard time actually shedding fat are perfect candidates for the Advanced LipoDissolve™ treatment. Treatments are tailored to each patient to fit their body type, lifestyle, and desired results. Unlike conventional liposuction treatments, Advanced LipoDissolve™ is non-invasive requiring no surgery or anesthetics. The treatment is often referred to as "lunchtime lipo" because the whole procedure takes less than an hour. 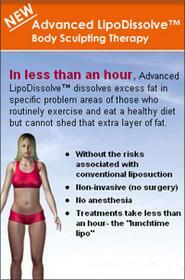 Dr. Schusterman believes firmly in the Advanced LipoDissolve™ treatment saying, "I am proud to represent fig. in the Houston Medical Community and am confident that the results of an Advanced LipoDissolve™ treatment will help my patients to look good and feel great both inside and outside." The national leader in medically supervised body shaping, fig. offers exclusive programs and proprietary procedures to help its patients achieve their body image goals. At the core of fig. 's offerings is the Advanced LipoDissolve procedure, a series of micro-injections used to dissolve stubborn pockets of diet- and exercise-resistant fat. Fig. is also the exclusive provider of the FinerForme Laser™, which is used in conjunction with Advanced LipoDissolve to enhance patient results and minimize discomfort. Dr. Schusterman is double certified -- Houston Board Certified in Plastic Surgery and Board Certified in General Surgery. He is a well-known and successful educator, author and public speaker. He has performed thousands of surgeries, including breast augmentations, implants, lifts and reductions, breast reconstruction after mastectomy, and body and facial contouring procedures. A complete list and description of procedures can be found at www.alwaysyouthful.com. Mark A. Schusterman, M.D., P.A. About this company Mark A. Schusterman, M.D., P.A.